What did birthday parties look like in 1904? I’m not sure, but I tried to figure it out for my daughter’s 9th b-day party this weekend. Being largely pregnant, and all, I tried to simplify a little from what I would normally do (but it never quite works out that way). 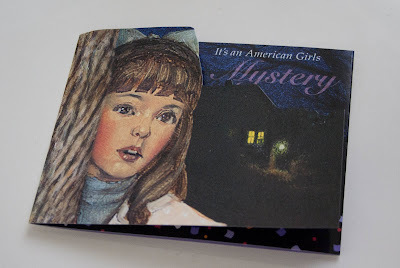 Several months ago, they were clearing out these mystery games on the American Girl website for $5.00/each. I’m thinking I got a pretty good deal, because looking at amazon and ebay, people are trying to sell this for over $100 now. The kit, really did make things easier. 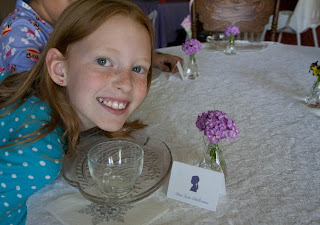 It had a mystery play with a script for each girl, invitations, character cards, clues, and instructions for the grown-up throwing the party. 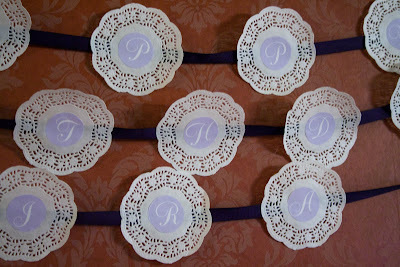 These are the invitations, which I used, but I had to add my own spin. Instead of filling in the blanks in the middle section, I designed these inserts that we glued into each invitation. The silhouette, that I used through out the party, is actually my daughters. I took a picture of her standing in front of a bright window, and tweaked it in my photo program, until I could turn her silhouette into a brush so I could use it in lots of things. I’m not sure where, but I’m pretty sure somewhere along the line, the “American Girl” books were featuring silhouettes as their logo. I couldn’t find them in their current materials, but I thought the cameo look was pretty old-fashioned, anyway, so we went with it. This is where things got a little complicated. 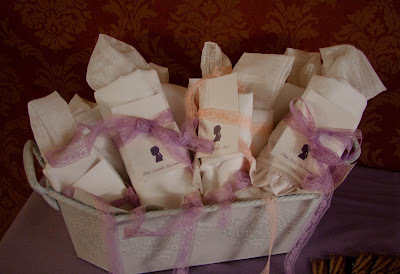 I am a big fan of giving out favors that guests will actually use again, not just junk from the party store. But I’m also super cheap! So when I decided the girls needed their own aprons and giant hairbows, do you think I was going to spend the money to buy them? Of course not! But those of you who know me, know that I am a bit afraid of my sewing machine. It is so much easier to say, “Mom can you whip this up for me?” Except, my mom isn’t around, and I thought if I picked out something really basic, I could manage. I found this tutorial at Skip to My Lou, for a basic apron. I liked that it used tea towels (one less step of cutting, etc. ), and I even took the step of buying pre-made ruffles so that I wouldn’t have to ruffle any fabric. My next difficulty came back to my cheapness. The least expensive towels I could find (that would work for the style I was going for) are those white floursack cloth towels. I washed them up before sewing, and WOW, did they get wrinkled! I spent several hours over the next several days, trying not to burn my protruding belly as I sprayed and ironed these silly towels. Other than that, I’m happy to report that my machine actually cooperated with me and the sewing part went pretty well…until I was trying to finish up the last apron on the day of the party and started having all kinds of bobbin issues. 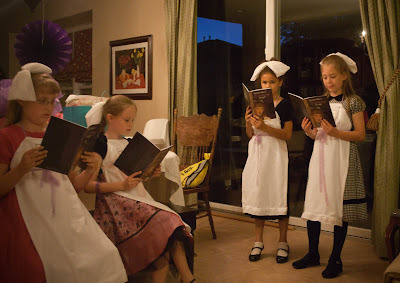 Fortunately, my husband was eventually able to get it worked out, and we had the aprons and hair bows (some sewing some hot glueing on those), packaged up for each girl when they arrived. Don’t they look cute wearing them as they act out their parts? The fact that I don’t have a picture that shows the entire set-up of the decorations and table, may or may not have to do with the fact that I was still assembling the cake as the guests arrived. 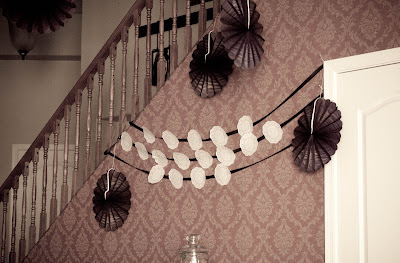 The good news is, I spent very little money decorating for this party. 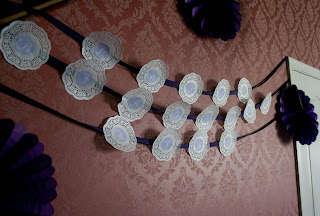 I made this birthday banner out of paper doilies and ribbon I had on hand. I printed out the letters and punched them out with a circle punch and glued it all together. The big purple circles were from a party a few years back. 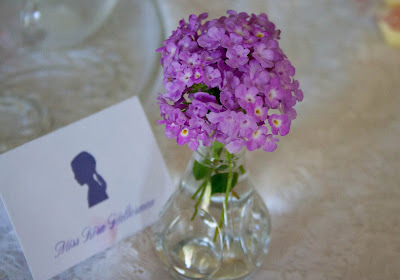 The only things I purchased were some inexpensive purple fabric for the table, and some tiny bud vases for place settings for the brunch (see below). We used nice glass plates for the food, since that is what they would have done, back in the day. Here is the cake! My daughter happens to love fondant. She is among the 1% of the population that likes fondant for it’s taste, and prefers the store-bought stuff to the homemade kind. I had plans to fancy this up a little with some decor around the bottom and some stenciling around the sides, but there just wasn’t time. 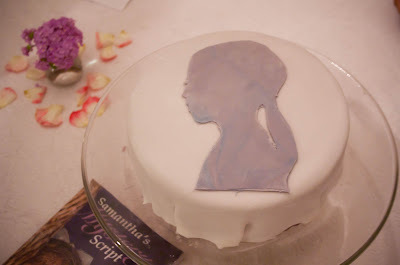 The girls were all amazed that I could get her silhouette on the cake anyway, and no one even mentioned the lack of a border. But the birthday girl was pretty happy with it! I also had some fairly grandiose plans for a fancy, formal brunch the next morning, utilizing some of the recipes found in the Samantha cookbook. When it became clear that most of the party guests wouldn’t be able to make it to that part, we mercifully scaled back a bit. 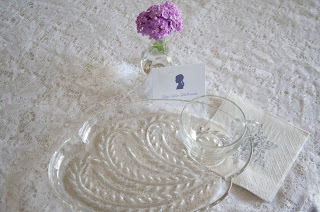 We set the table with a lace tablecloth, the aforementioned bud vases, and these awesome antique plates I inherited from Grandma, that have a little place for the cup, on the side of the plate. I had made placecards using the silhouette. We served a birthday breakfast stand-by in our house: Crepes filled with fruit and a cream cheese spread. And I think she had a pretty happy birthday! I’d like to thank Pumpkin Petunia for party inspiration. I think she may have been the one to alert me to the sale on the mystery games. She threw a similar party, here. And one designed around her daughter’s silhouette, here. Check them out for more inspiration! What a sweet party. It bet everyone had a wonderful time! That is just the most adorable party EVER! I love every single thing about it! That was a beautiful party! 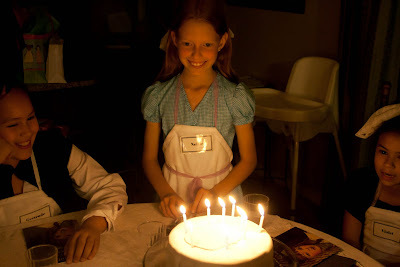 I loved the look on your daughters face with candles lit. She looked so proud! You did a great job. I have to show my seven year old, she will LOVE this idea! Thank you. Very fun. My girly loves Samantha and the other AG girls. She would be thrilled with a fun party like this. Very sweet. 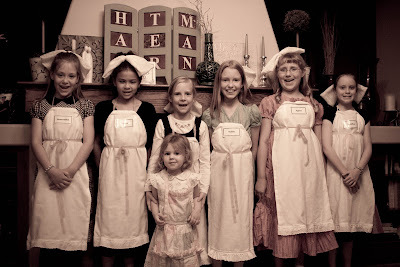 I love the photo of the girls in their aprons – you did a great job and they look wrinkle free! Kendra, this looks like such a fun and cute party. I love your touches, like using your daughter's sihoutette. This is so original as a theme!! LOVE it!! Loving that doily banner too!! So cute!! Hi!! You did a beautiful job with your daughter’s party. 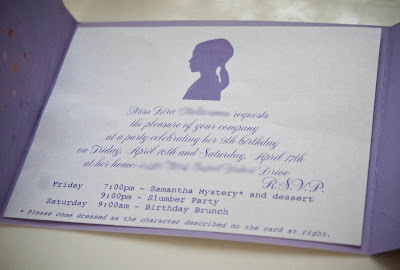 I just purchased a Samantha’s Mystery Party Game and it is missing one of the clues. You do not have by chance Clue 3, the letter that needs to be decoded. I know it has been a few years but thought maybe you had a picture of the letter you could send so I could recreate or if you were done could by chance send. Any help would be great! !